This independent short film tells of future when Dog People are suppressed by Anti-Dog people. However one woman rises to buck the system. Francis, a Black Great Dane/ Lab X is featured in this mini-movie. 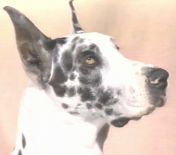 Francis also made it to television (June 2000) in a dog & owner pageant held by the X Show. A documentary about the relationship of dogs and their owners through the viewpoint of 4 different 'families'. This documentary which aired on PBS was filmed by The University of Southern California. 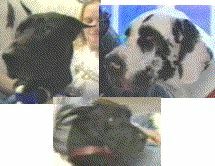 Two Mismarked Blacks & one natural ear Harlequin Great Dane make their appearance in this film. Note: Danes owned by Sixstar Danes. 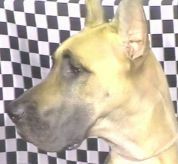 'Bronx' bred by Chanoz Danes 'Jordi' bred by Arctic Rose Great Danes. This short video (28 minutes) is a collection of scenes of dogs doing what dogs do - mostly sitting and playing. A video your dog may enjoy watching. Two Danes are seen - one Harlequin and one Fawn. Eyewitness Dog is a great video with plenty of canine footage and facts. It follow the whats and whys of dogdom along with history and myths. A Fawn Great Dane is seen briefly with many other breeds. A National Geographic Kids Video from the series Really Wild Animals. What makes a dog a dog?Comparisons of how pet dogs (and cats) are like their wild counterparts. A Harlequin Dane appears very briefly in one shot. A music video of kids singing. 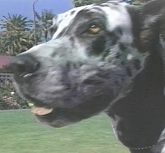 A Harlequin Great Dane is seen during the whole song, 'Walkin' The Dog'. This is the first song on the video. 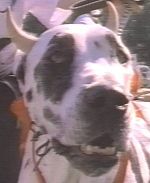 According to Kidsongs the Dane in this video was supplied by animal handler/trainer Clint Rowe. A video all about puppies. 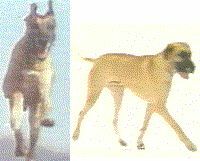 Several breeds are shown including Fawn & Brindle Great Danes.